I've had a few Altenew sets for a long time, but am only just getting around to using them. What was once intimidating is now inviting. Go figure! 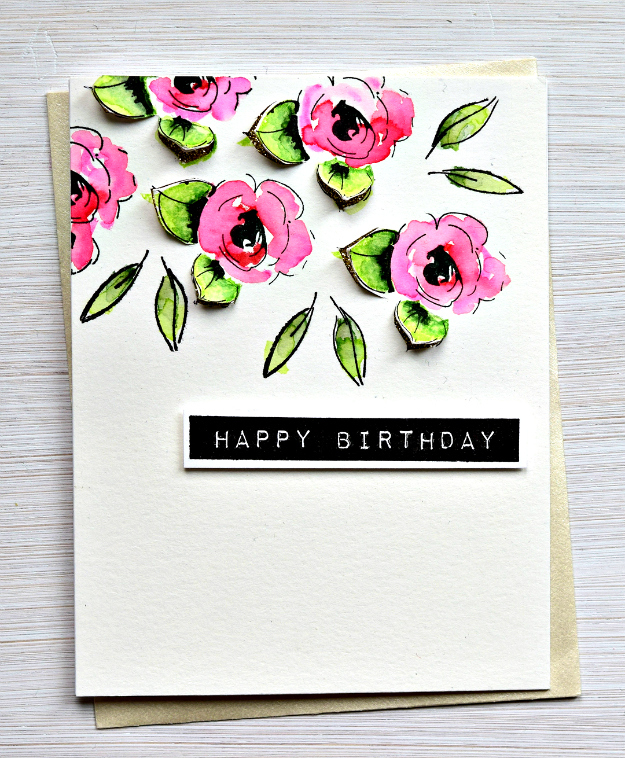 This card uses Altenew's Painted Flowers and Label Love on watercolor paper -- I've seen this combination used many times. 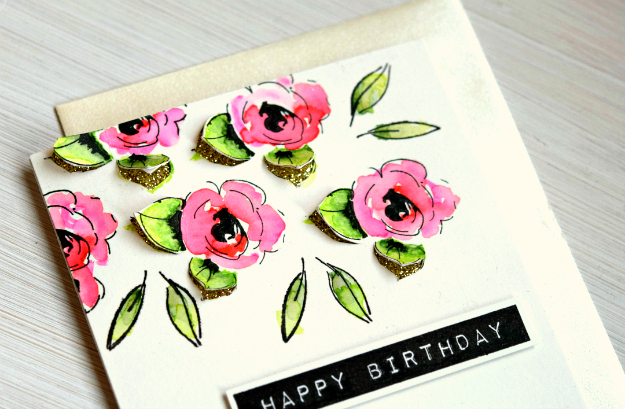 Stamped only the black outline and watercolored with a few Tombow markers. Used an Exacto knife to cut part of some of the leaves and adhered the panel on gold glitter paper, and then on an A2 card. And a personal, heartfelt thank you. Throughout the fall, many of you took the time to reach out to me through comments on this blog, email, facebook, or instagram. I read every comment and very much appreciated every one. It was only last week that I began stamping again. One of the worst things about going through the medical stuff was losing all interest in everything -- especially when I was in Europe (more on Belgium later). So I am so very happy to be back stamping. I look forward to sharing more. Thanks for waiting!!! Welcome back! I've missed your lovely creations and I'm glad you're feeling better. I love what you did with the leaves on this card, very cool. Beautiful! Very happy to see you back! This is stunning. Welcome back! What a beautiful way to make your comeback! Great card. I'm inspired by the peek of gold glitter under the leaves. LOVELY card Joan!! It is always a treat to see you in my inbox! Happy 2017 to you and yours. Can't wait to see more cards from you. Big Hugs!!! Glad you are back & feeling well enough to post. Your card is beautiful! I just purchased Painted Flowers & am eagerly waiting for it to arrive. Thanks for the gorgeous inspiration! good to see you again and creating such a lovely card - have a wonderful 2017! You are always worth waiting for!! Love your abundant talent and honesty in your writing and your cards that are not carbon copies of what others are doing out there. Welcome back!! Happy New Year, Joan! Lovely card and I am happy to see that you found your way back to creating, especially because it means you are feeling better!! WOW is this ever gorgeous!! I have this set and it intimidates me too, but you have nailed it!! So incredibly beautifu! This is one of my favourite flower sets ever and you've made me hungry to play with it again. The peeks of glitter! So fabulous. Very gorgeous! Love the curled leaves with the gold peeking out! And as for missing you, yes we did, but it is much better for you to tend to your health while we patiently awaited your return! Congrats on being back to the crafty room! Oh wow! I can't wait to give this technique a try - it's new to me! What a lovely card. Happy New Year! How many times have I looked at Altenew stamps and considered a purchase? Too many to count! Now, here you are, tempting me again with these flowers which are exactly what I'd love to have. I'm so glad to know you feel like stamping again, and what a beauty you've come back with. Love how you lifted the leaves to reveal the glitter panel underneath. Simply brilliant!